Our next HDI Houston Chapter meeting is sure to leave you with great insight! Please join us on February 27, 2019, at 8:30 am to discuss metrics that we love for service delivery! When discussing key metrics for service delivery, we all like to focus on a select few. IronEdge likes to start with staffing. How do we know we have enough staff when it seems like the more people we hire, the more work we get? The first is phone metrics. Primarily inbound calls. This is a key metric for us due to the fact that your ability to multitask while on a phone call goes down dramatically. The need to be attentive, patient, empathetic, and responsive requires a singular and focused mind. The next is going to be ticket backlog. There are stories within your backlog. What does it say? Are we properly trained? Does the client need new infrastructure? Are we “just busy”? These questions need to be answered well before the discussion of adding another resource to the team can begin. Secondly, we key in on metrics that tell us what the clients think? We can do this through SLA and Client Satisfaction Surveys. There are so many more, but what better way to know how the client feels than from their own words and how long it takes to get in front of the problem? The two often go hand in hand. Third, we focus on our productivity. Training metrics will often correlate directly with multi-touch issues. But once the team is trained, do those multi touch tickets magically disappear? Definitely not. What are some of the other things we can glean from a multi-touch ticket? Finally, how do we reduce the amount of tickets that come into the systems? We do this by turning ticket statistics into proactive support. For example, tuning incidents and proactively identifying problems before they become a larger issue. Another example would be entering perfect notes into tickets and wrapping them consistently, which allows our ticketing system to be just as robust a Knowledgebase as our documentation system. This ultimately allows us to get in front of the client with solutions, rather than problems. Mark has been with IronEdge Group since October 2010. He started with the company as a Desktop Support Technician and worked his way through the ranks, until he was named Service Desk Manager in 2015. After receiving his ITIL Foundations and Lean Six Sigma Green Belt Certifications, he was named Operations Center Manager in 2017. Since then, he directly manages a team of more than 20 technicians and ensures Service Delivery is held to the highest possible standards. With over 12 years’ experience as a technician, he enjoys acting as an escalation resource for the team and loves to teach them about the fundamentals of troubleshooting and service delivery. 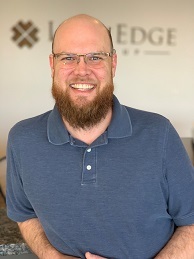 Before working at IronEdge, Mark worked as a Systems Administrator in the Oil and Gas Industry for a Fortune 500 company. His experience working in large corporations has provided him a unique insight into the importance of implementing scalable processes and procedures with the end result being efficient, effective, and service centric support for IronEdge clientele. To add to this, Mark enjoys working closely with Cultural Ambassadors of The IronEdge Group and loves to find ways to integrate fun and excitement into the lives of his team every day. When he isn’t learning and working on new ways to make his team better, you can find Mark enjoying time with his wife and daughter.